The growth registered in 2017 has been driven by a combination of factors: an increase on consumption in the main Asian manufacturing countries, the growth in export flows to the developed world and the increase in the average export prices. After two years of stabilization, the worldwide footwear production resumed growth in 2017 reaching 23.5 billion pairs, 2% more than in the previous year. Although this is still far from the fast growth pace registered between 2010 and 2014 (+15.4%), it represents a return to a positive dynamic. In terms of its geographic distribution, production continues to be heavily concentrated in Asia where 87% of all pairs of footwear are manufactured. Moving in the same direction, and after falling over a two-year period, worldwide footwear exports grew by 0.7% in terms of quantity and by 3.7% in terms of value. Growth was widespread geographically. China that is still responsible for 2 out of every 3 exported pairs of footwear has also recovered from a very negative trend. After a continued loss during the last 5 years, which cut its market share by six points, in 2017 China recovered 0.2 p.p. On the consumption side, in 2017 India overtook the USA as the second largest consumer of footwear: a milestone in Asia’s ascent to prominence in the world market, reflecting strong demographic and economic trends. China remains in pole position at the head of the 10 largest footwear consumers. From a global perspective Asia continues to be the main region for footwear consumption (54%), followed by Europe (16%) and North America (15%). The European continent, home of some of the most relevant players in this industry, has been gaining ground in the worldwide exports and in 2017 reached its highest market share in a decade: 13.8% in terms of quantity. In terms of value, Europe accounts for 36.7% of the global market, this being the highest level over the last six years. Europe is also responsible for half of the world imports: with 36.2% of the total quantity and 49.3% of the value, Europe is the most important destination for footwear imports. In 2017, the world average export price increased by 3% reaching a record level of 9.18 US dollars a pair. Over the last decade, the average export price has increased by 40%, with the fastest increase among all continents taking place in Asia (+60% in the same period). The average export price in China grew by 62% in the last decade, driving much of the global growth. 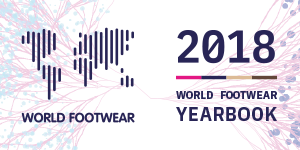 The World Footwear Yearbook, a project developed by the Portuguese Footwear Association since 2011, analyses the most important trends within the worldwide Footwear industry and offers a comprehensive picture of the footwear industry (for more information follow this link). In its most recent edition the publication presents statistics by 2017, both in quantity and value, giving a picture of the positioning of the main players taking into account production, consumption, exports and imports. 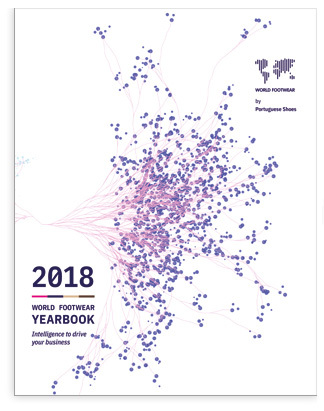 The publication also includes an individual analysis of dozens of markets,as well as the evolution of the main world players in this sector, with 82 countries under analysis. To get more detailed information about the footwear industry in 2017 buy your copy of the World Footwear Yearbook following this link to access the store.